Gone are the days where e-learning organizations, colleges, institutions used to maintain all their data in book records. Also, maintaining in any of these will fetch you for a no deal in admitting students for the program or participating in any certification courses. Because in today’s cut-throat competition, follow-up is an important element in converting a lead into a prospect and with book records it is very difficult to follow-up as the educational institutions get so many queries and most importantly following up at the right time is very crucial and in book records we tend to forget and remember after a long time. There comes a CRM for educational institutions, e-learning organizations that solve this problem. Now, your mind would be popping up why CRM for educational institutions or maybe which CRM should I invest in? Don’t worry, we have all the answers for you. So the universities, different educational institutions found that CRM is very much needed for their business and maintaining student relationships more effectively. Also, nowadays institutions are looking for a CRM as a niche for their needs. So generic CRM will not help to a greater extent. The solution is simple! SuiteCRM Education CRM which is specifically designed for their vertical is what required by the e-learning firms, universities and so on. ü Enriching the student life cycle by strengthening relationships with candidates, students, and alumni. ü Gives secure access of essential information by student, faculty or alumni which empowers them to manage and control their information. · Free and Open-source – SuiteCRM Education CRM is available for FREE. 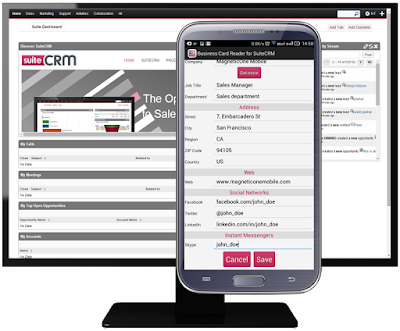 Just sign up a basic form and get a SuiteCRM Demo now. · Contact management – Student contact management is another important aspect which can help colleges, universities to quickly communicate and send targeted communications to the students regularly on time. · Easy integration with other software’s – SuiteCRM Free Education is a Robust, secure, stable and scalable system that will meet business competency at a strategic level. Its seamless integration will help you integrate with other software’s easily. · Data Migration – Free Data Migration of unstructured data if you are migrating to SuiteCRM Education CRM without pain of data-lose. · Task automation – Automate your tasks for repetitious day-to-day activities by addressing your people, process and technology needs. Boost your sales and maximize your profits by using Education CRM. SuiteCRM Education CRM is a Free and open-source tool to strengthen and maintain fruitful relationships with students, faculty and alumni.